Raised Relief Maps or Three Dimensional ( 3D ) topographic maps, offer an accurate representation of landscape showcasing all the features of a particular geographical area. Our selection of Raven Maps, Hubbard Scientific, USGS Sections, United States and National Park Maps is quite impressive. Raven Raised Relief Maps and Hubbard Scientific Relief Maps will make up the majority of Relief Maps on the market and you can find them all for sale right here. 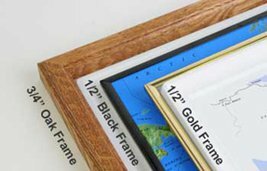 Framed options are available for all of the Raised Relief Maps in either Oak Wood or Gold & Black Plastic. The oak frame is 3/4" thick, the plastic frames (gold & black) are 1/2". With no glass, you can still enjoy the effect & feel the bumps of your 3D map!